I am excited to see that my film provoked such a response from someone as devoted to development as yourself. Interestingly enough I completely agree with all of the critical points you have made. To be frank, the film was not so much intended for veteran development types like yourself, but rather for concerned yet inexperienced western students. But still, your charge of oversimplification is a valid one. While making this film (and even now) I laid awake in my bed at night wondering if there was a better way to express the need for respect without such generalizations. As you can probably tell, the film is more about human interactions than development. I was seeking to capture the in a convincing way the reality that development deals with real people’s lives, and furthermore that those ‘people’ are not merely passive sufferers waiting to be saved by the west (think ‘SAVE DARFUR’). I wanted to capture some articulate young Africans expressing their critical opinions as a (perhaps overstated) warning against the type of objectification of the poor that is so common in the west. 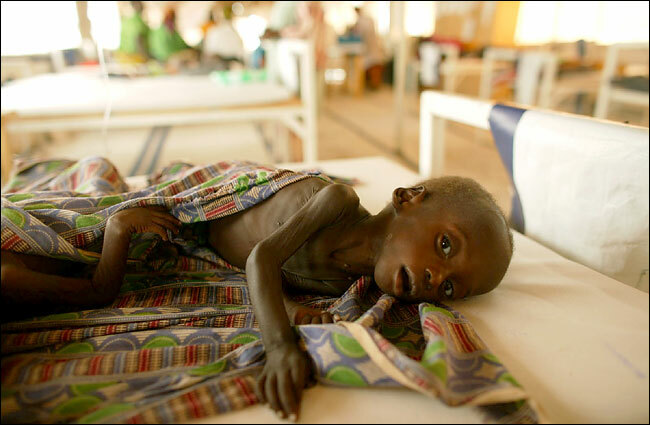 I wanted to make a counterpoint to the countless images of emaciated African children that appear as advertising for major NGO’s such as World Vision, Save the Children, or CARE. I wanted to shatter this objectified conception of the poor African because I see it as extremely harmful and detrimental to the very cause of development. My intention was to make the viewer wary of simple solutions. I wanted to complicate the picture of development that is given by the internet ads reading “Click here to save a child!”. I wanted to make people reflect on why the help others and the way that they do it. I wanted to show African’s who were not hesitant to DEMAND respect from those coming to help them, not to deter them from coming, but to make sure that they come in the spirit of sincerity and cooperation. Hopefully you saw that the main message of the film was that we need a respectful dialogue. Also, if you listen closely, you’ll see that I never said that we shouldn’t help people that we don’t fully understand. I simply said that we have to recognize that it is inherently harder to help people and communities which are foreign to us. There a tons of ways to help people abroad, but the path towards each of these solutions begins by recognizing the limitations of our own ‘expertise’. Perhaps I was too harsh in my iteration of this point, but I feel strongly that the battle against the mentality of the savior (a re-incarnation of the colonizer) is extremely important. You are quite correct that there are huge differences between humanitarian and development work, but the point about respectful interaction still remains. You are also right to point out the diversity of the NGO world. However, I think that you’ll find that the smaller more grassroots NGO’s that you refer to posses the commitment to sincere and respectful interaction that my film tries to articulate. There are many aspects of development work that are simply beyond the scope of the film. My film is not about ‘development’ (which is a pretty ambiguous and loaded term in itself), rather, as I stated above, it is about human interactions in the context of development. The reality is that most of the particulars about development and development NGO’s are beyond the scope of the film. It is really about people. I make no claim to treat the subject of ‘development’ in its entirety. To do so would be just plain silly. I tried to identify one small but important aspect of development (the need for respectful and sincere interactions) that I felt transcended specific contexts. I hope that my comments have helped you understand the intentions behind the film. I greatly appreciate the attention you devoted to the film. The development community would be better off if more people had the type of experiences and convictions that you do. Seriously – is this necessary? I’m curious to hear if others agree or disagree with this – feel free to leave comments and/or email me! Previous Post They Come in the Name of Helping?